Body: Vivid colorful design is printed on the body, which is pre-cut and ready to be mounted on the chassis. Rear Hubs: Updated design of the aluminum rear hubs effectively realizes shorter suspension arms to deliver reactive leg movement for traction efficiency. Transmitter: 2.4GHz Syncro KT-331P transmitter automatically manages frequency bands. Features full setting functionality and is compatible with future technological development. Better CG: Battery box positions the receiver battery near the center. Supports mass concentration around the CG for improved control. Receiver: Includes 2.4GHz receiver that delivers stable control response and easy frequency band management. Features failsafe function that automatically slows the car down if signal is lost. Shocks: Aluminum big bore oil shocks feature dial adjustment of spring tension and chassis height. Engine: High power KE21R engine equipped with easy to handle recoil starter. Includes polished tuned muffler. Bearings: Full ball bearing specifications use 20 bearings through the drive train. Strongest version yet of the 8 world championship winning Inferno. Factory assembled Readyset includes everything except fuel, batteries for transmitter and starting tools. 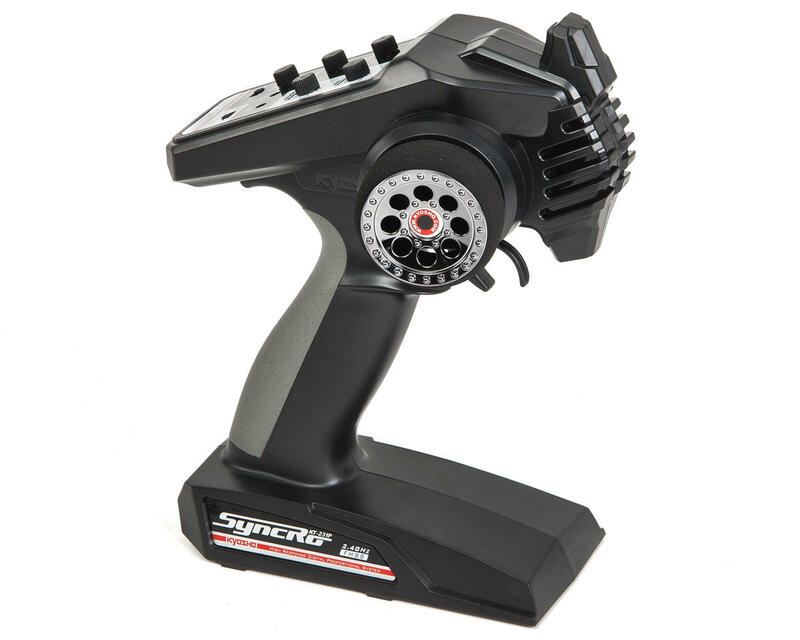 Equipped with high speed & high torque servos. 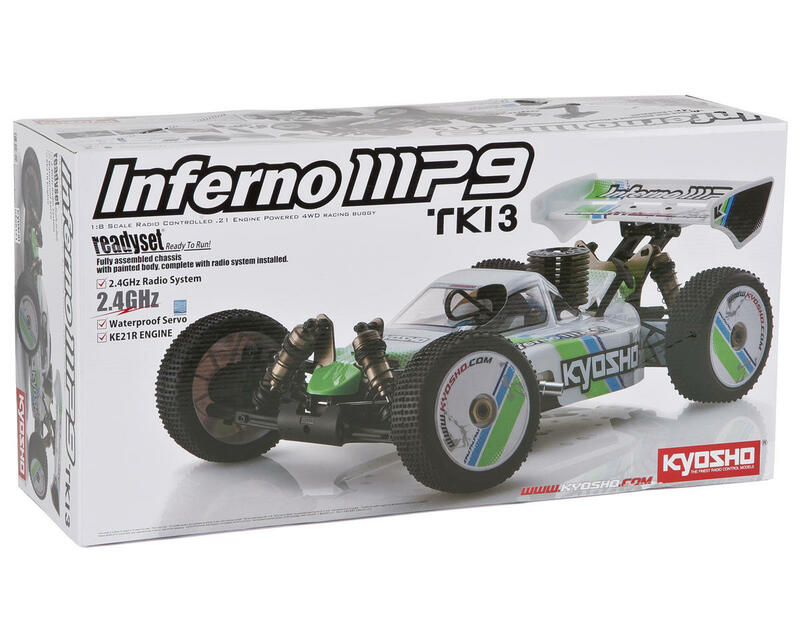 Original Inferno design shaft drive 3 diff full time 4WD chassis. Setting adjustments: wheelbase, tread, roll centre, caster angle, toe angle, and camber change ratio. Efficient heat sink brake disk and center diff with increased case capacity deliver stable control through to the end of the race. Bushings replace E-rings in the suspension structure to rationalize the setting and maintenance order. Mudguards prevent dirt entering the drive shaft or the wheels. Concave area on the side guards is compatible with the thickness of magic tape so body also prevents dirt entering the chassis. Stable fuel supply is delivered from fuel tank with easy hook cap. Uses stylish and secure hex screws on all parts. Features a large capacity air cleaner that extends maintenance cycle. I have owned this buggy for a few months now, and after running it and maintaining it I feel it's time for an honest review. I was absent for over a decade of rc, and decided on this RTR to start with. I can over time upgrade some parts here and there, while starting on a limited budget. Pros; Very well built and adjusted right out of the box. Comes with a pretty good radio system. Part availability is there, as are great upgrades. The engine was easily broken in, and it took about half a gallon to get it properly race ready (I race club events). Durability of parts are very good, and easily serviced. Cons; The manual is decent at best. The parts seem to be from the previous models (777 and the standard MP9). The bearing are basically skateboard metal shielded, and somewhat hard to clean and re-lube. The premount tires have very old school foams in them that have flat spots (I contacted Kyosho about this and they sent a new set. The description says that hex bolts and screws are used throughout the kit. This is NOT true. Most of the kit is composed of phillips screws. 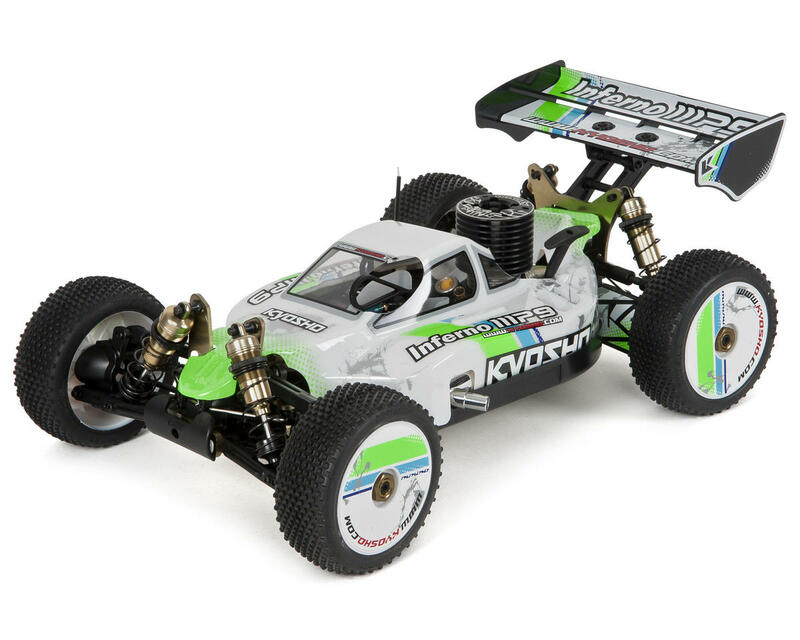 In my opinion Kyosho should send each owner a full set of hex screws and bolts due to false advertising. The engine was some what troublesome with many air leaks where the carb meets the crankcase, the HSN assembly leaked as well. I also had a simple leak fix at the manifold to pipe coupler. Better zip ties fixed this easily. I have practiced this kit when I can at my local track (haven't been able to race yet due to rain outs), and the only thing I have broken is the front shock stay/mount. Upgrade to the TKI3 kit mount and this will solve the problem. 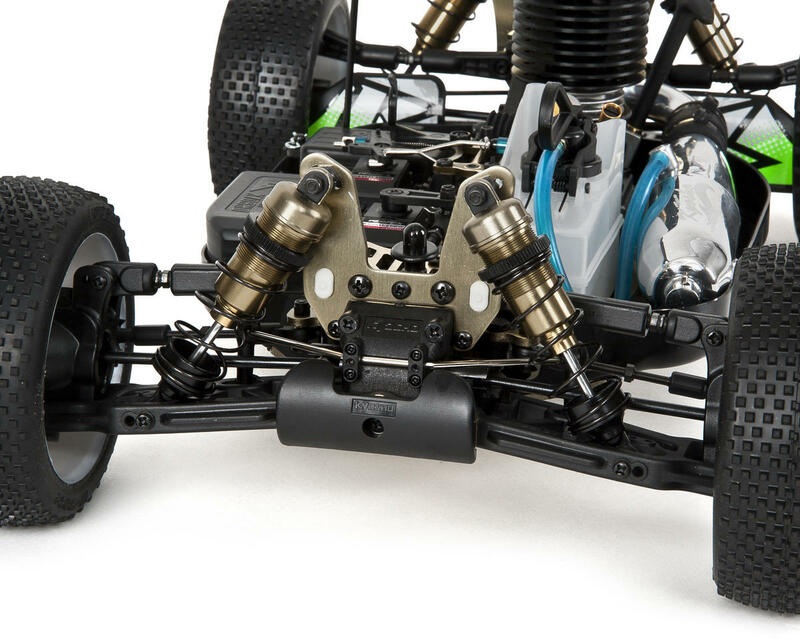 All in all, AMAIN has been great to talk to about parts for this RTR, ad Kyosho does build some of the best products out there, so with some internet help, and vast amounts of upgrades most problems can be solved. Would I buy it again? Most likely so. My choice came down to price, parts availability, and support. Serpent or Associated would be my flip of a coin for second choice. This thing is impressive! Almost finished with the first gallon. It was a bit intimating picking up a kit after 10+ years away from Nitro but everything about this is easy. Out of the box, the engine break in went very well and seemed to have been pre-run from factory- the manual said to use a 2 tank break in but I extended to 6. On the track, it needed shock oil immediately and loc-tite on all metal to metal. I've broken a rear carrier but replacements are inexpensive. Follow Cody Kings setup and have fun. with the discount this is a good inexpensive way to start into nitro and upgrade as you break parts such as turnbuckles and shock towers, arms etc. i am having trouble keeping engine running though but that could be my inexperience with nitro engines or possible bad fuel I might be using but when it does run it has plenty of power. Servos appear to be strong enough and steering response even though is good, might further improve once I slap on the lighter proline tires. 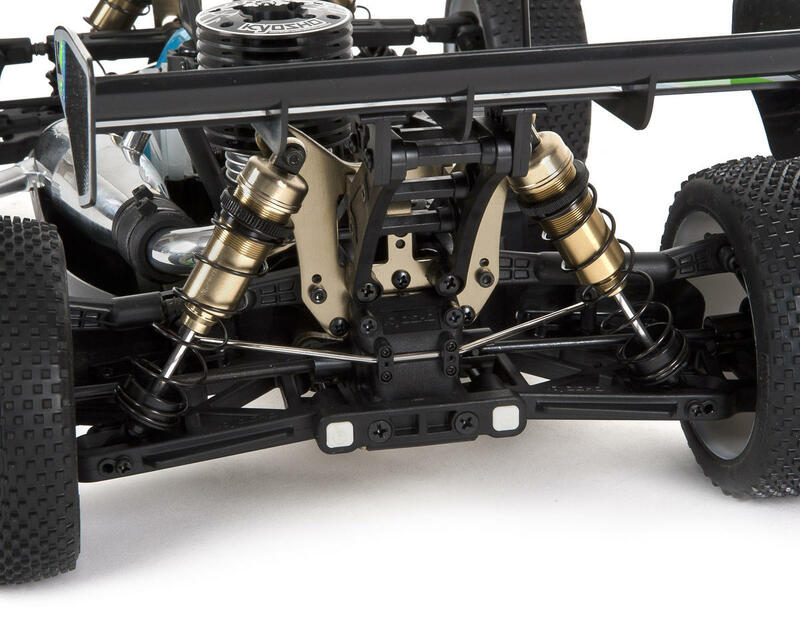 nice to see that factory drivers are using the tki3 setups as opposed to tki4 which makes this an even better buy....they are using the tki4 rear hubs and sometimes the high camber mount front shock tower but that's about it for suspension. 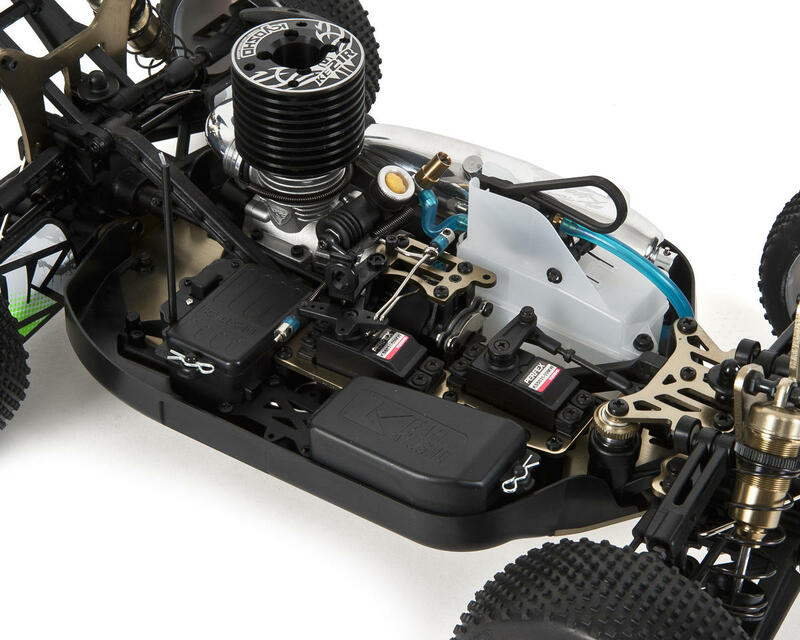 The shocks are basically the same except for the body, performance can't be that much better, just maybe get the blue springs as these black ones that come with kit are on the soft side. I learned later on that the diffs on the rtr only have 1 bevel shaft/gear vs 2 so once you're ready to rebuild you can add for durability. pick up some hub/hex shims also to take away the play at the tires. Getting the tki3 screw kit and outer front arm shafts will help tighten the suspension up a bit and make this car a little more durable. definitely suggest you get the hump pack for a receiver battery to get the 6.0 volts for the servos. Oh and unscrew each screw and add threadlocking compound. and like others have stated you will need to adjust the trim for the brakes on both the receiver as well as the connecting rods on the car. 2. The rear brake was not setup properly: the brake was applied when the buggy was coasting (engine idling, throttle at neutral), stopping it; had to readjust. 3. The wheels were not balanced, and the foam is decent at best. Other than that... so far so good. 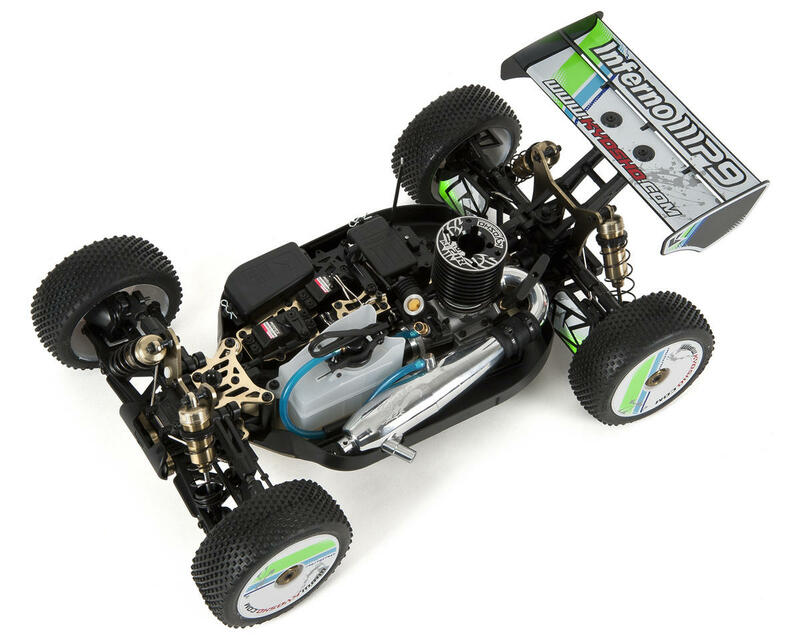 Great rtr buggy. Would recommend to anyone with a little bit of nitro knowledge looking to get into racing. best buggy ever. Everyone should buy it Kyosh rocks ok everybody.